Taylor VanBruggen of Taylored Expressions kicked off a Card Drive last Friday for a cause that is very dear to my heart. She is calling on card makers worldwide to create cards for a program at Sanford Medical Center in Sioux Falls, SD that has been developed to help grieving families who are suffering the loss of a newborn(s). This cause is so close to my heart because I have experienced this twice. The devastation of facing life without the baby you loved so dearly before you even met him or her, is indescribable. People, even those very close to you, say all the wrong things, and it is so hard to navigate through life for a very long time. Most people forget your lost ones, but you need to remember. You never forget. To have a picture, a blanket, a cap - anything that touched your precious one(s) becomes the most important thing(s) in your possession. The work that is being done today to help parents and families through this is incredible. I ask you to consider making at least one card for this cause. The dragonfly is the symbol of hope that this particular program uses, so a dragonfly has to be incorporated in your card. it can be from any company. Click HERE for all of the details. 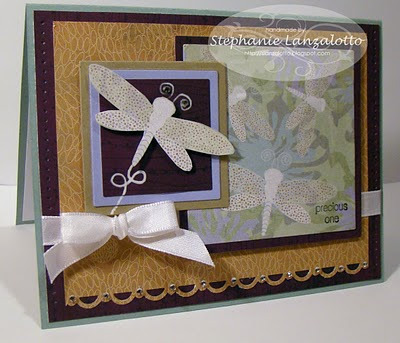 I did not have a dragonfly stamp, so I used BasicGrey's Wisteria DP which has beautiful dragonfly images on it. In the meantime, I ordered a gorgeous stamp set from TE called "Discover Your Wings" that has a beautiful dragonfly image. For a limited time, TE will donate $7.00 to an organization called "Now I Lay Me Down To Sleep", which you can read about HERE. Paper ~ Sage Shadow, Brushed Gold, Almost Amythist. Stamps ~ Cute Converse (SU retired hostess), Verve~Forever in Our Hearts. Ink ~ Elegant Eggplant (front), Sage Shadow and VersaFine Black Onyx (inside). Accessories~ Mat pack & piercing tool, Score Tape, Bow Easy, Hero Arts 2mm rhinestones, SY scallop punch, Saukra white glaze pen, SU white taffeta ribbon, Dimensionals.